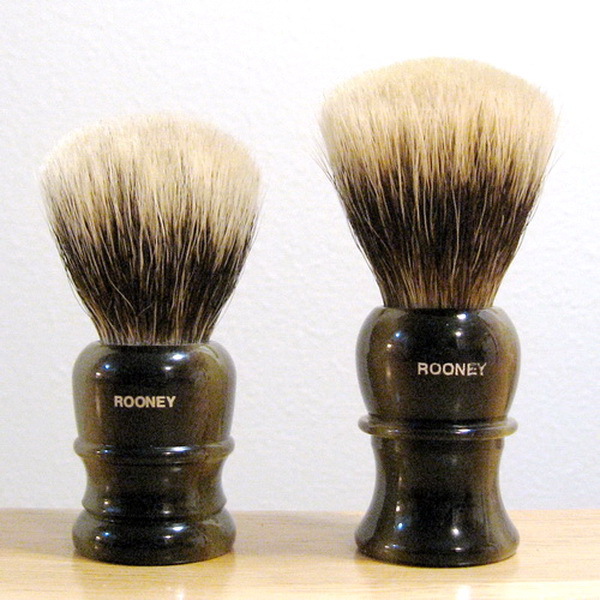 A couple new Rooney Finest brushes with faux horn handles have arrived, a 1/1 and a 3/1. When you say “new”, do you mean Lee Sabini is producing Rooney Finest again? Or, are they new to you? Just new to me. I had some already, and I added the two shown, which are in style/size/color combinations that I had lacked. Thanks, those certainly are handsome brushes. Have you had any issues with the Finest knot? I have a 2/1 Finest and the centre of the knot is starting to hollow out. When I examine the centre of the knot I see that the hairs are breaking about halfway down their shafts. I don’t think I’m a particularly vigorous latherere, but I do lather on my face using circular and paint brush motions. Because of this I use my brush sparingly, about once a month, now, having started this about 3 years ago when I first noticed the problem. I bought the brush 12 years ago and I’m the one and only owner. I must say that the Finest knot has a very pleasant but distinct feel; quite different to any other badger knots I’ve used. I can understand why you collect them. Have you had any issues with the Finest knot? I have a 2/1 Finest and the centre of the knot is starting to hollow out. When I examine the centre of the knot I see that the hairs are breaking about halfway down their shafts. I don’t think I’m a particularly vigorous latherere, but I do lather on my face using circular and paint brush motions. Because of this I use my brush sparingly, about once a month, now, having started this about 3 years ago when I first noticed the problem. I bought the brush 12 years ago and I’m the one and only owner. I have never had that problem with any of my Finests, although I think I have heard others besides you complain about it. I have always just used back-and-forth paint brush motions, when building lather and when applying it to my face, never anything circular because I heard sometime back that circular motion might be harder on brushes. But I also have enough Finests to allow use of each of them just once a month, so none gets used more than a dozen times a year; I'm sure that helps in their preservation, too. Absolutely lovely. The old Rooneys were stunners. About 6 years ago it happened that I obtained an unused RF directly from Mr. Sabini. I used it almost daily for several months and slowly it began to shed, slow at first, then increasingly until it was unthinkably rapid. I saved the small multi-hair clumps that had begun falling out. So I immediately stopped using it. Soon afterward I was able to forcibly but gently pull the entire brush head out. 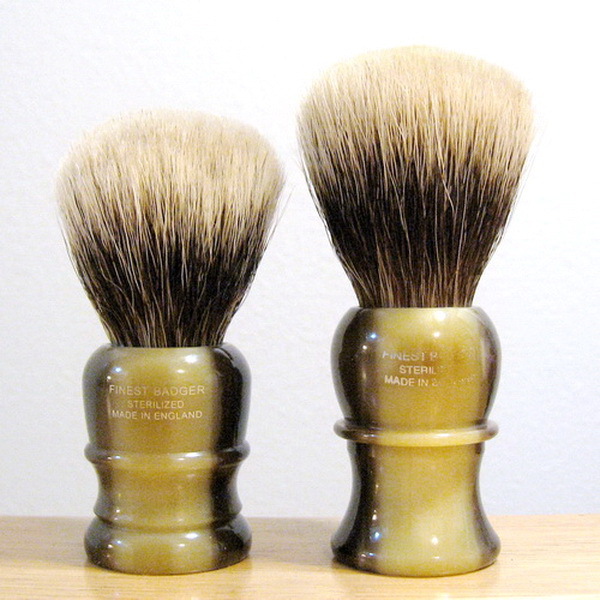 It was evident that there was a visible flaw in the glue at the center of the brush. Someone suggested I might ask Bernd at Shavemac if the could repair it, and yes he did. To this day it no longer sheds and it performs wonderfully. Gary, that's a good fix to know about if this ever happens to me.